My name is Julie and I am a full time client services representative. I have been working at Whole Pet Veterinary Clinic since February of 2016 and loving every minute of it. I enjoy the great people I work with and seeing all of our wonderful patients and getting to know our clients. I have had Shelties my entire life. 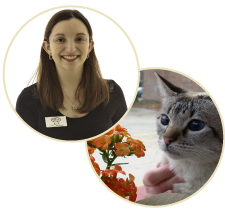 I have a strong interest in the fear free veterinary experience for the pets that come into the clinic as well as behavior and training. Outside of work, I enjoy singing, dancing, going to concerts, and spending time with family, friends, and of course dogs and cats!